It is so important to gain a strong testimony of the gospel and of your Savior. There are so many tools that the adversary is using to try and break you and destroy your testimony. This is a pine tree that used to stand in my yard. Pine trees are huge, this tree was taller than my house. 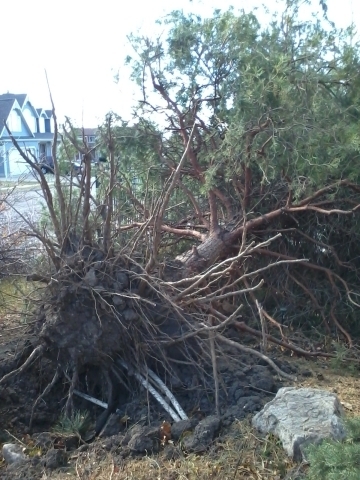 You would think that such a tree can never be knocked over by the wind, but this one was. It had shallow roots. There is a lesson to be learned from this tree. We may seem like we are big and strong in the gospel. Maybe we go to church every week, and we pay our tithing. What would happen though, if you went through a trial and didn't have a strong testimony? You wouldn't have strong enough roots, and you would fall. You must make sure that you gain a strong testimony. Life is going to knock us down - it is part of God's plan. When that happens, be prepared. If you have a strong testimony, you will be able to rely on God and you won't fall. You don't know when a trial will come upon you, so make sure that you have strong roots now. How can we gain a stronger testimony? Go to church- Listen. Pay attention. Contribute. Do more than just sit there with a bad attitude, doing that won't gain you anything. Read your scriptures- The scriptures are a gift to us from God. Many, many people sacrificed everything to give us these scriptures. READ THEM OFTEN!! Let their words become a part of you. I know that a lot of people don't read the scriptures because they feel like they aren't gaining anything from it. Make sure that you read slow and ponder what you are reading. Think about it- think about how it applies to your life. If that isn't helping, make sure that you are starting in a place that is easy to understand. The Book of Mormon, for example, is easier to understand than the New Testament, and the New Testament is easier to understand than the Old Testament. In my opinion, the Docterine and Covenants are easier than them all. No matter where you read, you can gain something. Just make sure that you search, ponder, and pray. Study the words of General Authorities- What the prophet speaks is scripture too. Don't forget that. Go to seminary/mutual- You can learn so much in seminary. It is a great way to really get stories out of what you are reading. Mutual is important too. It is a way to get to know all of the youth in your ward and to become great friends with them. Make sure that you are worthy to feel the spirit- You gain a testimony through things that the spirit makes you feel. Sometimes, I've felt the spirit SO STRONGLY that it is impossible to deny. At the end of the day, your testimony will come through the spirit. Keep the commandments- This one probably blankets everything. All of these things that I have listed... we have been asked to do them. Follow the prophet. He really does speak for the Lord. This video is called "The First Step." Hopefully you will be able to see that it's not hard to gain a testimony. If you ask the Lord, and try your very hardest, you will receive a testimony. Just take that first step. to finish, I want to share a scripture. "ye receive no witness until after the trial of your faith." That comes from Ether 12:6. Remember that if you want to gain a testimony, you have to make an effort. You can't pray and say "give me a testimony on the Book of Mormon" without reading it. If you do make an effort to read it, and then ask, you will then receive a testimony. Remember that God will always answer your prayers. He can give you a testimony.